Milwaukee, the chief city and port of entry of Wisconsin, capital of Milwaukee co., on the W. shore of Lake Michigan, in lat. 43° 2' N., Ion. 87° 54' W., 75 m. E. of Madison, and 85 m. N. by W. of Chicago; pop. in 1840, 1,712; in 1850, 20,061; in 1860, 45,246; in 1870, 71,440, of whom 33,773 were foreigners, including 22,599 natives of Germany, 3,784 of Ireland, 1,435 of Bohemia, and 1,395 of Scotland. There were 14,226 families and 13,048 dwellings. The population in 1874 was estimated by local authorities at from 95,000 to 100,000. The lake opposite the city makes an indentation in the shore, forming a bay 6 m. wide and 3 m. deep, which is easy of access at all seasons. The Milwaukee river, which flows through the city, and is joined near its mouth by the Menominee, has been rendered navigable to the heart of the city by vessels of any tonnage used on the lakes. It is regarded as the best harbor on the S. or W. shore of the lake. The climate is peculiarly bracing and healthful, and the atmosphere is remarkably clear and pure. The city is regularly laid out. -The centre, near the Milwaukee and Menominee rivers, is the business quarter; and the E. and W. parts, the former of which is built upon a high bluff overlooking the lake, while the latter is still more elevated, are occupied by residences. The material used in building is largely the beautiful cream-colored Milwaukee brick. The streets, except those in the commercial quarter, are generally well shaded. There are three lines of horse cars. The principal public buildings are the new county court house, the United States custom house and post office building, the academy of music, the opera house, and music hall. Milwaukee has railroad communication with the iron mines of Michigan, with the principal points of Wisconsin, with Chicago, St. Paul, and the railroad system of the east and west, by means of the Milwaukee and St. Paul, the Western Union, the Chicago and Northwestern, the Wisconsin Central, and the Milwaukee, Lake Shore, and Western lines. The receipts and shipments by these lines and by the lake are of great extent and value; wheat and flour are the most important items. The number of vessels entered in the customs district (which includes the entire lake shore of the state) from Canada, for the year ending June 30, 1873, was 49, with an aggregate tonnage of 14,435; cleared for Canada, 135, tonnage 39,324; value of imports, $222,055; of exports, $3,018,906. The value of goods received under the act of 1870 permitting shipments in bond from the ports of first arrival to interior ports was $76,532. The entrances in the coastwise trade were 2,979 steamers, of 2,026,054 tons, and 4,722 sailing vessels, of 553,925 tons; clearances, 2,943 steamers, of 2,011,550 tons, and 4,432 sailing vessels, of 545,193 tons; belonging in the district, 235 sailing vessels, of 36,252 tons, and 58 steamers, of 13,867 tons; built during the year, 37 vessels, of 8,493 tons. The receipts of other grain in 1873 included 921,391 bushels of Indian corn, 376,634 of rye, 1,768,058 of oats, and 1,209,474 of barley; shipments, 197.920 bushels of Indian corn, 255,928 of rye. 990,525 of oats, and 688,455 of barlow There were also received during that year'3,650,194 lbs. of butter, 203,416 hides, 59,969 sheep skins, 241,099 live and 158,955 dressed hogs, 17,262 beef cattle, 11,745 sheep, 136,017,000 ft. of lumber, 93,233,000 shingles, 11,058,000 ft. of lath, 239,877 tons of coal, 222,961 barrels of salt, 2,681,927 lbs. of rags, 5,022,840 of "Wisconsin tobacco, and considerable quantities of hops, cranberries, peas, beans, cheese, eggs, etc. There were shipped 2,842,-501 lbs. of butter, 3,133,042 of wool, 54,334 hides, 17,997 live hogs, 10,261 beef cattle, 10,-291 sheep, 4,216,420 lbs. of Wisconsin tobacco, 137,111 barrels of salt; 80,010 barrels of pork, 24,954 tierces of hams, 62,211 boxes of middles and sides; 1,915,610 lbs. of bulk meat, 4,065 barrels and 24,399 tierces of lard, 5,365 barrels and 462 tierces of beef, equivalent in the aggregate to 329,267 barrels of 200 lbs. each, and valued at not less than $5,000,000; and (by rail) 29.791,465 ft. of lumber, 24,097,-150 shingles, and 630,400 ft. of lath. The storage accommodations for grain, comprising five elevators with a combined capacity of 2,450,000 bushels, have been inadequate for the trade; but in 1874 a new elevator with a capacity of 1,000,000 bushels was erected. Pork packing, in which six linns are engaged, is extensively carried on. The number of hogs packed in the regular packing season (Nov. 1 to March 1; of 1873-'4 was 296,142, of an average net weight of 201 lbs. The manufactures are extensive, and embrace lager beer (which is highly esteemed and widely exported), pig iron, iron castings, Hour, leather, malt, machinery, agricultural implements, highwines, tobacco and cigars, furniture, brooms, paper, woollens, wagons, soap and candles, doors and windows. boots and shoes, steam boilers, car wheels, baskets, trunks, and white lead. The product of the blast furnaces and rolling mills for 1873 was valued at about $3,500,000; of the flouring mills, $5,000,000; of the breweries, $2,-600,000; of the distilleries, $1,500,000; and of the tanneries, $3,000,000. The Milwaukee iron company is engaged in the manufacture of pig iron, railroad iron, and other kinds of merchant iron; the Minerva furnace company produces pig iron. The receipts of ore were 103,427 tons, shipments 26,940; receipts of pig iron, 11,457 tons; manufactured in the city, 35,120 tons; shipped, 8,330 tons; receipts of railroad iron, 6,099 tons; manufactured in the city, 34,494 tons. The number of breweries is about 20; quantity of beer sold in 1873, 260,120 barrels; distilled spirits or highwines manufactured, 29,207 barrels, of which a considerable portion was redistilled and converted into alcohol. There are 13 mills, which, besides the flour, produced more than 46,000,000 lbs. of bran and middlings, and three ship yards. The number of hides tanned was 149,082. In 1874 there were four national banks, with an aggregate capital of $750,000; circulation, $657,400; deposits, $2,808,752 53; resources, $4,706,225 23. There were four state banks, with an aggregate capital of $266,325; deposits, $2,480,196 79; resources, $4,427,011 50. The two savings banks had a joint capital of $125,000; deposits, $1,403,989 97; resources, $1,553,955 77. There arc four private banks, four fire insurance companies, and one life insurance company. The aggregate receipts of the banks in 1873 amounted to $451,086,356 90, which sum is regarded as a fair indication of the total volume of business of all kinds transacted in the city during that year. - Milwaukee is divided into 13 wards, and is governed by a board of aldermen of one member and a common council of two members from each ward. There is a municipal court, presided over by a single judge. The police force consists of a chief, two lieutenants, four detectives, two station keepers, a pound keeper, and 40 patrolmen. The fire department has five steam fire engines and a fire alarm telegraph. The city is supplied with water from the lake by water works recently erected. The United States courts for the E. district of Wisconsin hold two sessions here annually. The assessed value of property in 1873 was $48,559,817; expenditures for general purposes, $895,392 97; total debt April 1, 1874, $2,464,980 74. The northwestern national asylum for disabled soldiers is about 3 m. from the city. It occupies a brick building, having accommodations for 700 or 800 inmates, with which are connected shops and stables. The grounds embrace 425 acres, more than half of which is under cultivation, the residue being laid out as a park. The institution has a reading room and a library of more than 2,500 volumes. The present number of inmates is about 400. In the city there are three orphan asylums, a home for the friendless, and two hospitals. The public schools, 21 in number, are graded, and include a high school. In 1873 there were 38 male and 127 female teachers employed; number of pupils enrolled, 11,224; average attendance, 7,100. The number of private schools was 47, with 7,000 pupils. Milwaukee female college had 6 instructors and 118 students, of whom 44 were of collegiate grade. The library of the young men's association contains 11,000 volumes, and that of St. Mary's institute 1,000. There are 8 daily (4 German), 1 tri-weekly, 2 semi-weekly, and 16 weekly (6 German) newspapers, and 1 semi-monthly (German) and 5 monthly (1 German) periodicals. The number of churches is 59, viz. : 3 Baptist, 1 Calvinistic Methodist, 1 Christadelphian, 5 Congregational, 1 Dutch Eeformed, 5 Episcopal, 4 Evangelical Association, 1 German Reformed, 2 Jewish, 10 Lutheran, 1 Lutheran Reformed, 9 Methodist Episcopal, 5 Presbyterian, 10 Roman Catholic, and 1 Unitarian. 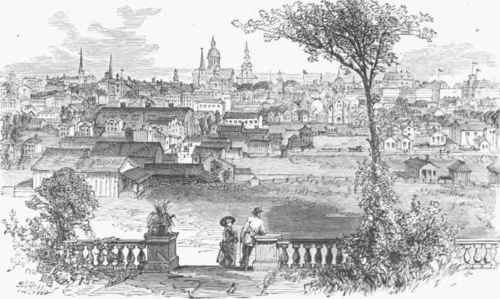 - Milwaukee was settled in 1835, and incorporated as a city in 1846.